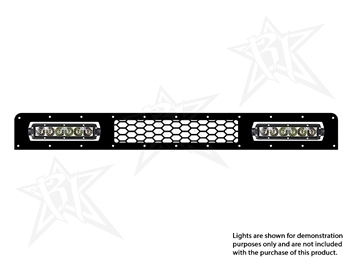 This Rigid Industries lower LED grille is designed specifically for the 2005-2013 Toyota FJ Cruiser and allows for a clean, discrete install of Rigid Industries high output lighting. This grille accepts two (2) 6" SR-Series LED light bars (lights not included). This 2-piece grille is made from laser-cut 304 stainless steel and is assembled using stainless steel button socket head bolts and nyloc nuts - no welds. It features a high quality black powder-coat finish and mounts securely using OEM mounting locations. Installation is simple and straight-forward - no drilling or cutting required.